Pentax K-z with multiple colour ways coming? Leaked posters appear to show that a new Pentax K-r replacement is on the way, complete with a seemingly endless array of colour varieties. Pentax is known for creating "different" looking cameras as a way to stand out from its competitors, especially in Japan where a wide variety of colours are available compared with other markets. It's not yet known whether the K-r replacement, or the K-z as it appears to be called, will be available across the world in different colours, or whether the company will play it safe in more "traditional markets." The leaked banner shows that the camera can be customises to feature any combination of body colours, right and left grip colours, power lever colours, built-in flash colours, mode dial colours, battery cover colours and the rather suggestively titled filled 'bottom parts' colours. Other than the crazy colour combinations, little is known about the specs on board the camera. The K-r has already been discontinued, but it features a 3 inch screen, an 11 point autofocus system, 720p HD video recording and a 12.4 million pixel sensor. 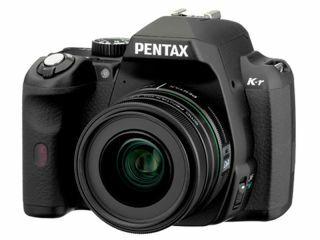 Pentax was bought by Ricoh last year, but it seems to be retaining a large degree of autonomy following the takeover.